Choose the right Callaway Driver with our Callaway Golf Review section. The Callaway Driver Review section will provide you with reviews, advise and tips around the Callaway Golf Drivers. Callaway Golf Clubs are one of the most popular Golf brand in the World. Many great Tour Players play Callaway Golf Drivers and Irons: Annika Sorenstam, Charles Howell III, Eduard Romero and Ty Tryon. The latest innovation is the Callaway ERC Fusion+ Driver. Read the Callaway Driver Review for the ERC Fusion below. Callaway Golf has created a powerful chemical reaction with the introduction of the ERC Fusion Driver. This driver's explosive distance is the result of Fusion Technology, which blends the best elements of titanium and carbon composite materials into an exciting new mixture. Titanium and composite, power and precision, technology and playability- ERC Fusion brings it all together. The Fusion has a forged titanium cup-face and a lightweight carbon composite body. The cup-face design wraps around the face and extends into the crown, ribbon and sole areas of the head, similar to the face design of the ERC II Forged Titanium driver. The cup-face construction is designed to make the clubface stronger while variable face thickness (VFT) technology is designed to maximize COR and distance. The 11- and 12-degree ERC Fusion Drivers have more weight positioned in the heel and have a slightly closed face angle to help higher-handicap players square the clubface at impact and reduce slice-creating sidespin. The 8-, 9- and 10-degree ERC Fusion Drivers have internal weighting that is more evenly spread across the perimeter of the clubhead, which works with a square face angle to help golfers produce a straight, repeatable ball flight. And the 7.5-, 8.5-, 9.5- and 10.5-degree ERC Fusion Drivers have more weight toward the toe of the clubhead and slightly open face angles to help better players with higher swing speeds to shape their shots as desired, whether that be a controlled draw or a power fade. ERC Fusion Drivers feature Callaway Golf's new RCH System 55 graphite shaft in strong, firm, regular and light flexes. This lightweight shaft is 45 inches long, which is long enough to help produce exceptional clubhead speed while still delivering control and balance. For women, the new RCH System 50 graphite shaft is an inch shorter and even lighter. For golfers looking for more shaft options, ERC Fusion Drivers will also be available by special order with a number of popular after-market shafts factory-installed. 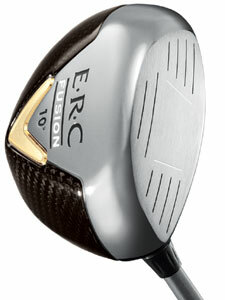 The ERC Fusion Driver is a lightweight and is easy to swing. Improved sound compared to the doll sound of the old Callaway C4 Driver. Best price: Click here to get the best price for Callaway Drivers and the new Callaway ERC Fusion Driver at The GolfWareHouse.com.